In search for a cheap hotel, one of the tourism officers in Enchanted River informed us that two floating ‘fish cages’ are offering cheap overnight stay for tourists and it was just only 15-minute boat ride off coast the main land Hinatuan. Instead of having another island tour, we decided to discover this unique lodge situated in the middle of the sea. We chose the Fish-C Cages & Sand Bar Resorts which was nearer compared to Sibadan. We headed to the north side of the river where the local boat operators await. We met Manong Arturo and we booked a boat that took us to our destination of choice. 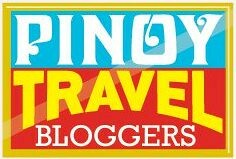 We paid Php200.00 for the back and forth trip. 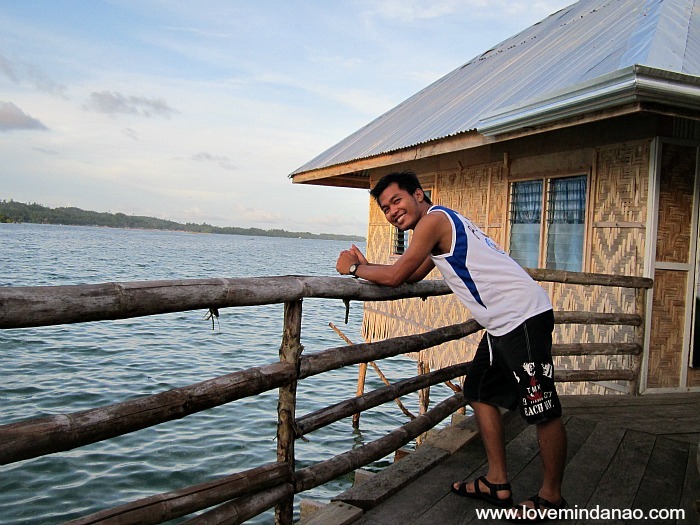 (no more fees were collected on the next day at the time we returned to the mainland in Brgy. Talisay). The ‘fish cage’ was actually smaller than Sibadan and some portion of it were still under improvement. Nevertheless, the location was breathtaking considering that it was not a usual practice among visitors to stay in the middle of the sea. 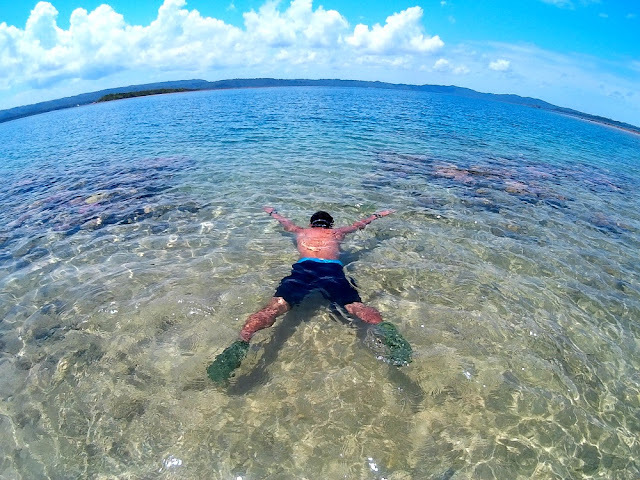 At first, I was actually hesitant to stay in the middle of the sea, thinking what if a tsunami hits the eastern side of Mindanao or a typhoon slashes over and swept us away off the ocean -but that was just my wild imagination and my curiosity won over and empowered me to brave the area. The facility was built at least a kilometer away from Enchanted River. The holding structures were made of drift woods, and the sawali walls resembles the stilt houses of Tausugs and Bajaos in Tawi Tawi. The roof was covered by the common nipa, shading the tougher aluminum roof to protect it against the harsh and corrosive salty atmospheric environment. There were more or less 8 rooms available during our visits. Two common comfort rooms with sewage system were also functional. Water tanks were rain fed connected to the faucets of the rest rooms and of the common sink. Sing It and Beat It ! A huge multipurpose function room is available for group activities such as dining, meetings or simply doing some videoke nights. Videoke in the middle of the sea? How? The place has an ample supply of electricity via a long cable installed across the shore. This made our night complete after we had a bountiful dinner with cooked fresh caught seafood served on the table. I even tried some of my master pieces that gave me 100% score. Yes Love Mindanao has a hidden talent in singing that those who hear my angelic voice wish that my talent be hidden forever. According to the manager of the resort, during low tide, a long sandbar appears beneath to which the resort was built at. So we waited for 12 midnight but it was this animal beer (Redhorse) that knocked us off before we even saw it. Early in the morning I was greeted by this amazing sunrise viewed at the dock of the fish cage while seeping a nice hot instant coffee. It reminded me of a local coffee commercial “Bakit ka Gumigising sa Umaga?” (What makes you wake up in the morning?). And that day my answer was unusual for me- “I am thankful to God that I am blessed with another day to witness the Lord’s beautiful creation”. It hit me hard that put me on my knees to pray and give thanks to the Supreme Being. Got a Freebie by Getting Up Early! Too much for a 'close encounter' huh! A huge plus on our stay was seeing this huge Hawk’s Bill, a sea turtle swimming in between the stilts. I just realized that the area was a cage where this turtle got trapped. As an admirer of the sea creature, I swam with no fear into the water and had a close encounter with the sea turtle. (I don’t recommend doing the same for your own safety). Fish of different sizes and colors also appeared in the fish cage and rumbled on pieces of bread thrown into the water. After a satisfying Filipino style breakfast composed of danggit (dried fish), eggs and fried rice, we prepared to depart the place and head back to Brgy.Talisay. 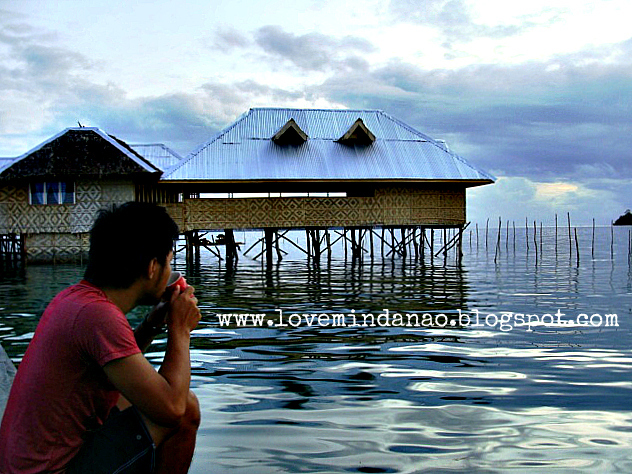 Check my previous blog entries on Finding Your Way in Surigao del Sur: The Tri-Aqua Mindanao Adventure. Daghan Salamat ug Balik Balik ! Thank you sir Ed Escueta ...hope to see you soon in one of your trips here in Mindanao... Bless you. That was a nice bonding experience with the sea turtle. I sure would want to do that to. Gotta belt a Michael Bolton song out there whenever I'll be there. ariel of Little Mermaid ? or Ariel Rivera? joke .. hahahaha ... sarap jan ! Go as long as you consider your safety ... they bite ! Such a nice place to stay. And a unique one, too! I would love to belt out in the middle of the sea! This is a complete adventure from the scenery, the food, the accommodation, and the activities. the river fits its name... truly enchantingly crystal clear... it seems there's a lot to do in surigao... thanks for the ideas. Yahweh bless. By the sea, it feels so refreshing and I think travelling at middle of the sea is something to be nervous especially when you are not used to it. I want to see a big turtle and catch a fish by myself. wer planning to go to Enchanted river this october and bring our own car. i just wanna ask if we want to go to fish cage sand bar, is there any safe parking lot for our car? even if we leave the car overnight? because we want to stay in fish cage also. thanks for the info sir!! !we'll definitely go where you went.. Indeed it is .. very nice place ... no need to haggle yourself finding a cheap accommodation back in town or in Bislig.... peaceful pa.
Hi, safe ba yan tulugan if may kasamang foreigners? Hi jeth, yes the place is safe for everyone and even for foreigners. you can reserve the room . there is one that is good for 12, for 2, and for 4. just contact Lysil on her number I have posted on the article . Let her know I referred you . thanks . Hi, we're planning a trip to Hinatuan this August. Would you happen to know if they get storms there? We're particularly concerned with C-fish, is it safe from storms, strong winds, high tide etc? pwede ba tayong mag fishing outside sa inyong fish cage? just for recreation? and are you open by Oct.31- Nov.2?